Zuma urges ANC members to resolve party matters internally - SABC News - Breaking news, special reports, world, business, sport coverage of all South African current events. Africa's news leader. Zuma led the party's election campaign in eMpangeni on the KwaZulu-Natal north coast, where he embarked on a door-to-door campaign and later held a mass meeting in Esikhaleni Township. Former African National Congress (ANC) President Jacob Zuma has pleaded with party members and supporters, who might be unhappy with internal party matters, to resolve their grievances internally instead of punishing the party. Zuma led the party’s election campaign in eMpangeni on the KwaZulu-Natal north coast, where he embarked on a door-to-door campaign and later held a mass meeting in Esikhaleni Township. 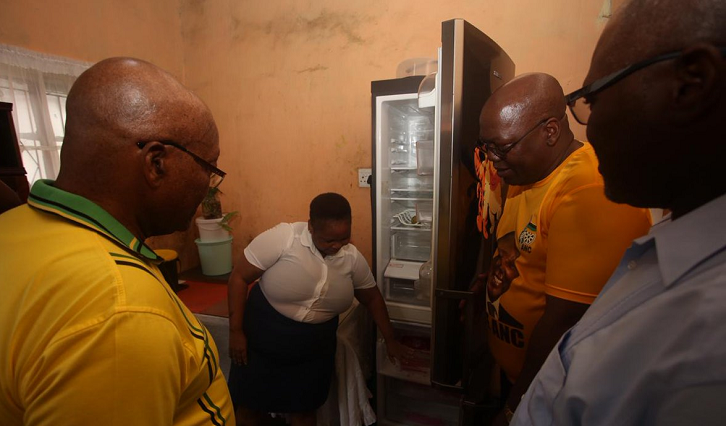 Scores of ANC members and supporters joined Zuma as he walked door to door and later attended a mass meeting to garner support ahead of the May general elections. Addressing the crowd, Zuma has called on party members and supporters to resolve their concerns internally. Zuma has also called on voters to be patient with the ruling party, saying correcting the legacy of apartheid cannot be done overnight. The former ANC president is expected to continue with the party’s campaign in other parts of the province.